Due to a take over by Frank Spiering (RDS Rebreathers) service and maintenance has been substantially improved. Check out their new website! 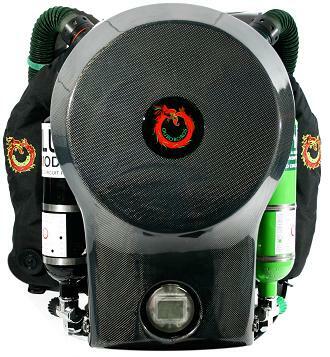 I did my deepest dive (236 mtrs in cold water) on this legendary rebreather: the Ouroboros (I have no. 5). The build quality of this eCCR is amazing. It was the first eCCR with a wide range of electronic features intended to dramatically increase safety. Those electronics, however, make it a complicated unit: not suitable for every eCCR diver. Difficult to travel with. Hard to maintain. Nowadays maybe a bit outdated, the Ouroboros is still the choice of extreme (cave-)divers. The general rating has been downgraded to two starts because of the fact the the Ouroboros is not produced anymore and spare parts are only available on request. Calibrating the unit requires the proper selection of a calibration gas. 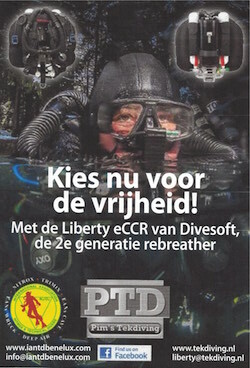 Divers who owned a VR3 diving computer, find manipulation of the handsets quite similar to the use of a VR3. Packing the scrubber is an art and requires some practice and time. Cleaning the unit is simple, but for removing the lungs one has to unscrew the canister base. Sometimes it can be difficult to unscrew the breathing hoses. The OPV in the exhale lung needs to be cleaned regularly, otherwise it can stuck open: water can enter the unit. In the beginning the big dome of the unit didn’t fit well, causing a lot of flooded units. A reinforcement band for the dome was supplied to the users. Later versions of the Ouroboros had a stronger dome. However when the unit is not properly closed, the risk of flooding still remains. An option is a hydrophobic membrane (quite expensive!) to keep the water away from the scrubber. Maintenance and preparation of the unit requires much attention of the diver. Trim is good, when the top weights are in place. The position of the lungs and the large breathing hoses make it very good breathing unit, except when the diver is swimming on his back. The WOB of the Ouroboros is still one of the lowest in the world. Only two liter tanks can be fitted. With some effort it is possible to fit three liter tanks. The placement of the tankvalves is important (cross flow). One could fit another BCD or backplate. One has to pack the whole (heavy) unit, which makes it a unit hard (and expensive) to take on a plane. The gastanks are only used for the CCR. Gas for your dry suit or BCD should come from off board tanks. It has all the necessary safety features like a HUD, independent back up display and ADV. A lot of money is needed (in Europe). Transportation and the GBP/EUR exchange rate can make it even more expensive. More than 10.000 EUR. Spare parts are not available with the manufacturer. They are produced on request and special demand only. Not indestructible, but the inner works (piping) look like a piece of art. The finest materials are used. The unit is CE rated until 100 mtr. The Ouroboros is and was the choice of many extreme cave- and wreck divers. The handsets easily survived 236 mtrs.